asks you to take an employment test? NEW from Ask The Headhunter! Taking employment tests without understanding your rights—and how tests work—can be a big mistake! you win the right job! Why do employers really use pre-employment tests? How do pre-employment tests work? What will help you perform well on tests? How can you Get The Edge when you compete for a job? Should you try to psych-out an employment test? Should you only give answers that you believe the employer wants to hear? The simple answer is an emphatic NO. But, do you know why? Get The Edge! Myth-busting answers from an insider! Author Erica Klein, Ph.D., has been an employment testing specialist since 1998. Dr. Klein has worked in commercial, non-profit, and government domains. She develops and administers tests (and has taken every type of test in this book herself). Now she's here to help you prepare for your next employment test! and interprets research for employers. to give you the edge! What kinds of tests will you have to take? the best websites about employment tests. when preparing for your next employment test. before you take a test. Don't take any test unprepared! 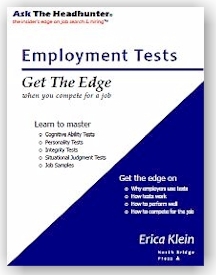 Employment Tests: Get The Edge shows you how! Employers have a profile in mind for what it takes to succeed in a job. They use a variety of employment tests to identify and hire someone who best fits that profile of success. position to compete for the job! "I've included a Crib Sheet in Emploment Tests: Get The Edge to help you prepare for any test an employer wants to give you. Use it to make sure you've got the edge to do your best every time!" Time to take another employment test ? > Do you know your rights? > Do you know why employers give those tests? > Do you know how to perform at your best? Can you afford not to Get The Edge On Employment Tests ? Just $18.95. Get your edge now!